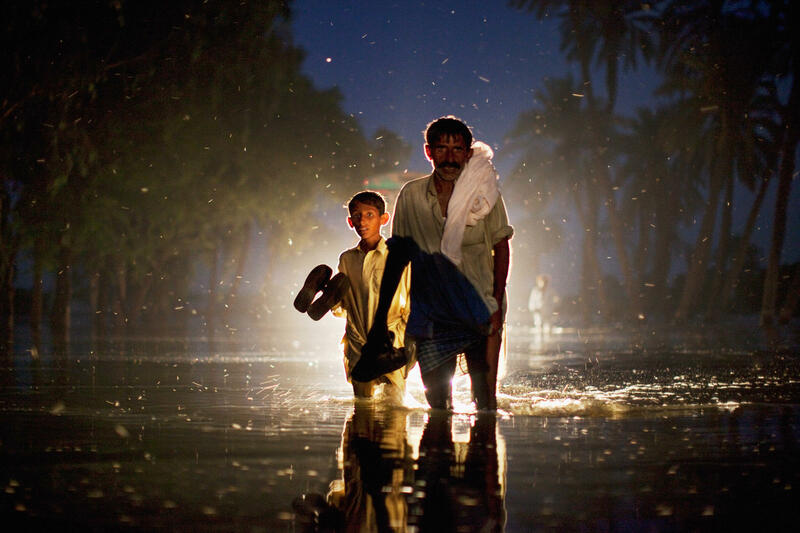 A Pakistani man and boy walk through floodwaters on Aug. 22, 2010, in the village of Baseera in Punjab. Hurricanes and floods don't just wash away crops and livestock and businesses. Marcia Bauer will tell you there's another loss that feels just as devastating, even if you can't see it with your eyes: the loss of your sense that you can plan for the future — that it's even worth trying. Bauer is the owner of a feed and gear store serving cattle ranchers and rice farmers around the rural Texas town of Winnie. Before Hurricane Harvey, she was investing a lot of money to attract more customers — getting involved in horse competitions and agricultural festivals. "And then I'd just had an electronic sign installed to help boost my business," says Bauer. "That was a $30,000 expense. It hadn't been up a month before the hurricane hit." A lot of the ranchers who buy from Bauer lost their herds. A lot of the rice farmers lost their crops. Bauer's business ground to a halt. She thinks eventually things will pick up, but she wonders if her ambition for her business will ever recover. "When you have something tragic or something that costs you money happen, you always reassess your game plan," she says. And Harvey was so unexpected it has changed her calculus. Even after she's fully recovered, Bauer says, her focus will probably just be on building up emergency reserves. She's done trying to boost her income. "Like I told my husband, I said, 'I've just given up on setting goals, because you take one step forward, three steps backward." A new study suggests this kind of reaction — scaling back aspirations and economic choices — could be a common effect of natural disasters. The evidence comes from Pakistan, which, in 2010 went through a sort of Harvey of its own — a massive flood larger than any the country had seen in 80 years. "You literally had a fifth of the country under water," says Katrina Kosec, an economist at the International Food Policy Research Institute and one of the authors of the study. And as with Harvey, she adds, many of the affected people did not live in areas where flooding on this scale was common. "So communities got a shock that they couldn't have anticipated." A year and a half later, Kosec and her collaborator, Cecilia Hyunjung Mo, a political science professor at Vanderbilt University, surveyed about 1,000 households in these communities and a virtually identical group of about 1,000 households that had not experienced the flood. "So you're comparing individuals with the same amount of income, the same amount of assets that might fuel their future hopes and dreams," notes Kosec. And then the researchers asked about those hopes and dreams: How much annual income did they eventually hope to make? How many years of schooling did they want for their kids? It turns out the individuals who experienced severe unexpected flooding had much lower aspirations. Their ambitions matched those of people who had half as much income but who hadn't gone through the floods, according to the study's findings, published in this month's issue of the journal World Development. It's worth underscoring that Kosec and Mo were comparing individuals who not only had the same current income stream, but who possessed roughly the same assets, education and other measures of economic and social standing. So it's not that the flood survivors had scaled back their ambitions because they had to make up for flood damage. Compared to unaffected people in the same economic situation, the flood survivors just had lower aspirations. Worst of all, this lowering of ambition among flood survivors seemed to carry a real-world consequence: The study found that they were less likely to make investments that might grow their income moving forward such as planting seeds or taking loans to expand their businesses. It makes sense, says Kosec. A lot of the things we do to get ahead in life — staying inside to study for a test instead of hanging out with friends, spending our money on tuition or tools for a business instead of buying an expensive dinner or even just keeping the money in a rainy day fund — all of this amounts to putting off pleasure or security today in the expectation of a bigger payoff tomorrow. "But imagine you're in a circumstance where you feel you have no control over what happens to you," says Kosec. "In that circumstance it doesn't really make sense to forgo income today and to make sacrifices for the future because you consider the future very uncertain." And in the case of the flood victims, the shock of that experience seemed to have dented their faith in their ability to build a better future. "We asked a lot of questions about people's sense that they have control over their lives. What we saw is that a fatalism really took hold." The effect was strongest among those people who were the poorest — and who had therefore lacked savings or a wider network of family and friends with resources to cushion the blow of the floods. Alaka Holla is an economist and program manager in a unit of the World Bank that evaluates the impact of poverty programs. And she does have some cautions about this study. For instance, she notes, "it's very difficult to measure aspirations — to get an accurate, consistent measure of aspirations." But Holla agrees with Kosec on the larger takeaway: When it comes to dealing with a natural disaster, it's important to remember the hit may not just be to people's wallets. Just as important, says Holla, is "recognizing that if this natural disaster has also blunted aspirations, then you might need to do something more." And it might not take much: A subset group of the flood survivors whom Kosec studied got some government aid. Not a huge amount — essentially about a month's earnings. But for this group, their aspirations were the same as those of people of comparable income and assets who had not gone through the flood.